What is true Low Milk Supply? What is the difference between a poor start to breastfeeding and low milk supply? There is much sensationalism in the media these days about infant weight loss and breastfeeding. Learn the facts so you can educate others. 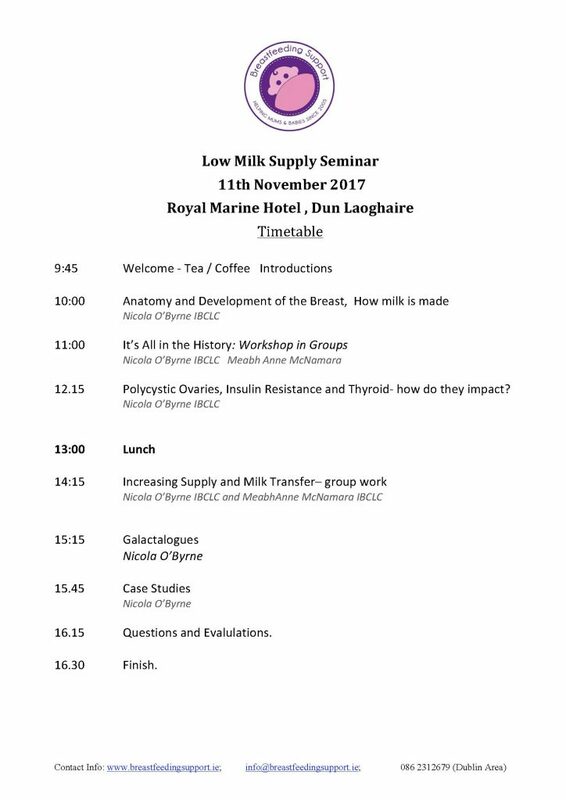 Topics covered include how milk supply is established, taking a history, in depth exploration of the causes of low milk supply, how to develop an effective care plan for dyads. Supplements /galactalogues. Clinical skills to optimise milk transfer and supply. Who is this teaching day suitable for? IBCLCs, Student IBCLCs, midwives, practice nurses, PHNs, GPs and doctors who are interested in learning more about lactation. It is also suitable for experienced breastfeeding counsellors. Is this suitable for IBCLE exam candidates? Yes, CERPs (5.25L cerps) and attendance certificates with timetable provided. Attendance, tea/coffee/scones on arrival. Handouts. Complementary car parking, Wifi . *Lunch is not included in the fee * There are many lovely coffee shops in Dun Laoghaire. Previous attendees have strolled down the pier and got quick lunch. Babes in arms are most welcome (in fact encouraged!) . The event is not suitable for older babies/toddlers who are very vocal and mobile. Please be aware, it is a formal teaching day and if your baby is unsettled, it’s best to step out and tend to their needs outside. Booking is open now please fill in this form and proceed to paypal. We are unable to invoice employers or hospitals, receipts can be issued to confirmed attendees before the seminar, if they wish to apply for reimbursement.